There comes a time in every magician’s act when he needs to make a handful of coins vanish. The Multi Coin Vanish is the key skill to making this happen. The magician takes four or five coins and streams them from one hand to another as he goes about his act. He passes the handful of metal from one hand to the next and all the while the faint clinking of coins provides a backdrop to his story. 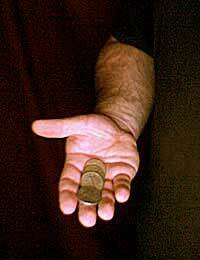 After one pass of the coins from hand to hand he pauses, holds up the receiving hand, and opens it to show that all the coins have vanished! The key move is similar to a finger palm vanish, and what is normally the enemy of the magician- coins clinking together- actually provides the key misdirection. While this trick could be done with buttons or other small, noisy objects, it works very well with coins. No advance prep needed beyond practice, and a plan on how to make the coins reappear. The Multiple Coin Vanish is not a trick in and of itself, but rather a sleight of hand move that often provides the key to performing some other illusion. This move should be practiced until it can be performed flawlessly, and it will take practice to determine how many coins the magician can manage when performing this sleight. Taking a handful of coins in his right hand, the magician holds them in a fist and then lets them dribble out into his waiting left hand. This move is then repeated from left to right hand. The magician then holds the coins in his right hand, palm up and open, with the hand slightly cupped and the coins on the palm. He then tilts the right hand over his open and waiting left, allowing the coins to pour from one hand to the other. Again, this move is repeated from left to right. This time the magician repeats the pouring move, but faster, quickly dumping the coins from right to left, and this time making a fist of the left hand. The right hand drops to the side as the left fist is raised (actually holding the coins), then the right hand comes up as the coins are dribbled from the bottom of the left fist. Now the audience is set up for the magician to perform the vanish. The same pattern is repeated as before- the coins are dribbled from right to left, and then left to right. The coins are poured from right to left, then from left to right. Now comes the vanish. This time as the magician goes to perform the quick dump, he allows the coins to fall not from his right palm to his left, but from his right palm to the natural bowl of his right fingers. The magician should close the left fist as if it just received the hand full of coins and raise it up as before, casually lowering his right hand. The left hand is squeezed and the fingers work together, as if rubbing the contents of the hand out of existence. The hand is opened slowly to reveal that all of the coins have vanished. When the actual move is made, when the coins go from right palm to right fingers, it needs to be done quickly. The clinking of the coins as they slam into each other will sound exactly as if they fell from right hand to left. This is the key that, along with the fact you are repeating a move already seen, will convince the audience that the coins are indeed in the left hand.